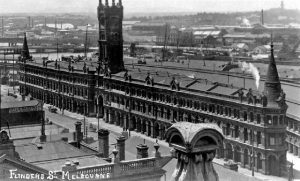 Think of Melbourne’s Flinders Street Station and chances are you think of the dome, the archway and, most of all, the clocks. Generations of Melbournians and their visitors have met “under the clocks” before sallying forth to experience the city. But at the other end of the station, it’s a story of commerce, not passengers. 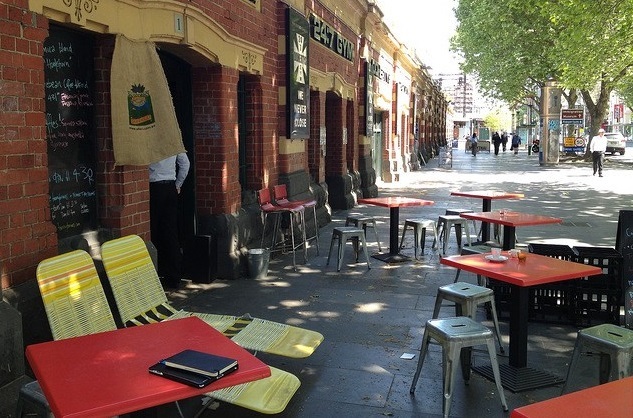 Here you’ll find echoes of a time when the station was a vital link in Melbourne’s food chain. Fresh food came by rail and river, to be sold at the now-vanished markets that once dominated the city’s south-western corner. When surveyor Robert Hoddle laid out the grid for the fledgling city in 1837, the site bounded by Market, Collins and William Streets and Flinders Lane was set aside for a market. 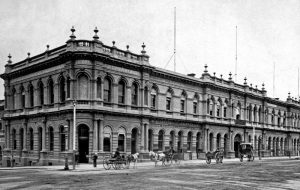 Known as the Western Market, it opened in 1841 and remained Melbourne’s wholesale fruit and vegetable market until 1930. Impressive though this building was, it was outdone in grandeur by the Fish Market (also known as the Melbourne Corporation Markets) on the corner of Flinders and Spencer Streets. Demolished in an extraordinary act of civic vandalism in 1959, the building was designed in the ‘eclectic’ style – in other words, no turret or tower, colonnade or curlicue was deemed too fanciful. In the days before refrigeration, produce would travel to the markets overnight, with trade beginning in the early hours. 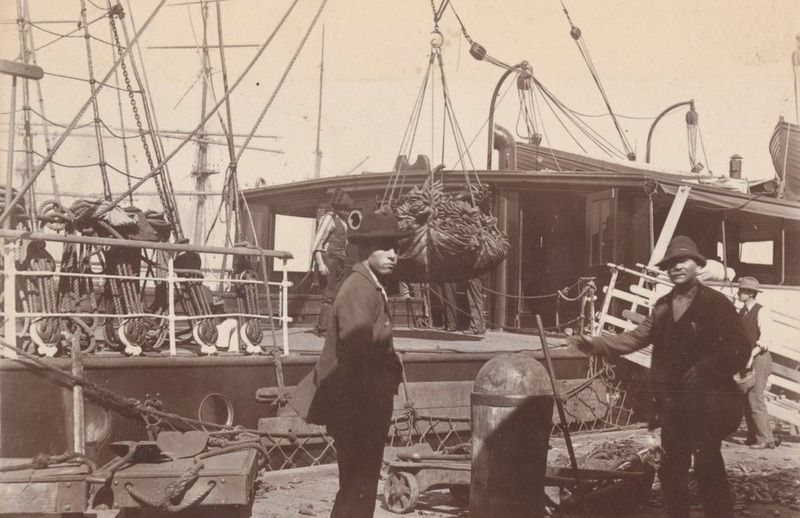 Boats anchored at Queen’s Wharf on the Yarra River would unload fruit and vegetables, while the ever-expanding railways transported goods from country Victoria and beyond. 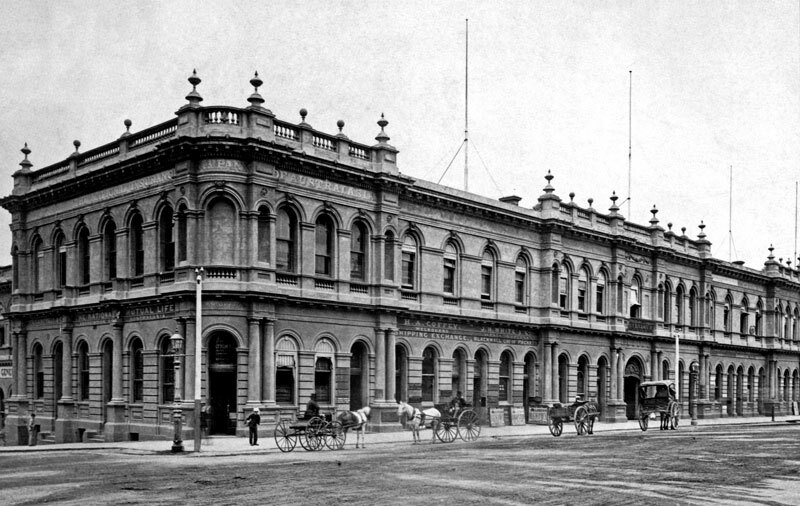 The Flinders Street Station building we know today was completed in 1909. At its western end, a section of Platform 1 was extended to receive freight, including the parcels that were routinely railed around the state. It was here that fresh milk in large metal cans arrived from country Victoria, especially Gippsland. At some point in the 1920s a roof was constructed over the area, which became known as the Milk Dock. Trains were shunted into the Milk Dock where the cans were unloaded. Carts and trucks lined up in the bluestone loading bay adjacent to the platform, ready to load the milk for distribution to suburban dairies. Emptied and cleaned cans were loaded onto the trains to be returned to country depots. Newspaper reports of the day complain of chaos on the Milk Ramp that sloped down to Flinders Street, with trolleys, porters and carts creating hazards for each other and for passers-by. The parcel service is no more, the roof (of corrugated asbestos sheeting) has long been removed and the western end of Platform 1 is no longer open to the public. The Milk Ramp is still there. But there’s no milk being unloaded these days. The suburban dairies that delivered milk to our doorsteps are gone and pre-packaged milk arrives at supermarket warehouses in giant refrigerated trucks. 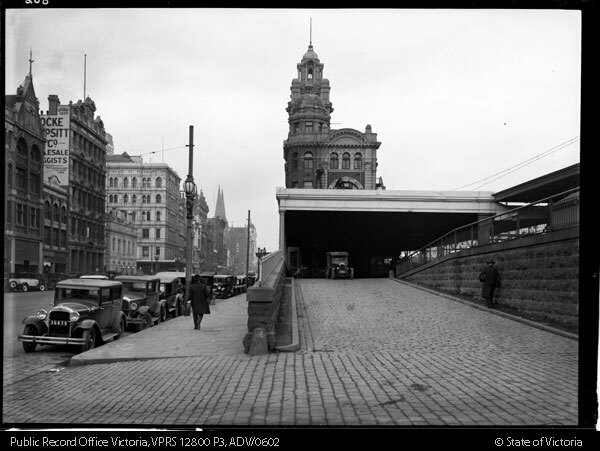 In 1891-92, before work commenced on the current building, a railway viaduct was built to link Flinders Street Station with Spencer Street Station. The arched vaults under the railway line, originally known as the Viaduct Buildings, were handily placed between the river wharves and the Western Market, making them the perfect place to store produce. The vaults were divided into 33 separate spaces, with first tenants being recorded in 1893. Bananas, in particular, were stored here. The fruit was picked and transported green, but exposed to ethylene gas in the vaults to bring it to perfect ripeness. Hence the name: Banana Alley. Unloaded at Queen’s Wharf, the bananas came with spiders, insects, snakes and rodents concealed within the bunches. No doubt some of these unpleasant denizens lingered on when vaults were abandoned in the 1930s after the construction of the Spencer Street Bridge prevented ships from reaching the nearby wharf. A few businesses struggled on in Banana Alley, including a café and the infamous 24-hour Pieteria that operated for a couple of decades from the 1950s. After hitting a low point in the 1970s and ‘80s, when the area was the sort of place you wouldn’t go after dark, Banana Alley has been rehabilitated (at least to some degree). It now houses a nightclub, several heavy looking gyms, a secure bike park and a small café with banana lounges outside. How appropriate!